One of the main missions of our Centre is to create environmental learning opportunities, specifically with a focus on youth. 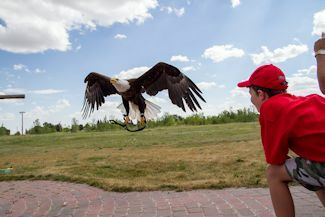 Being able to reach out and touch the feathers of a live owl, or see an eagle fly overhead just a few feet away, can be a life changing and memorable event for any young person. What better way to inspire today's youth than by visiting a working conservation facility, where children are able to observe wild orphaned and injured birds before their hopeful release back to the wild. To kick start the summer at the Centre, every May we welcome thousands of visiting school children from many communities throughout southern Alberta. We look forward to providing them with a guided tour, full of fun facts about all of our feathered friends. Thanks to a growing reputation, an increasing number of schools are also visiting us from greater distances such as central/northern Alberta and communities in Saskatchewan and British Columbia. Thanks to our knowledgeable staff and volunteers, we are able to offer a diverse learning experience to a variety of educational levels ranging from elementary to high school, as well as college and university classes. 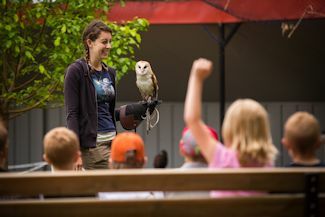 While many of our programs focus on elementary level curriculum featuring educational opportunities about owls, life cycles, and species adaptions, we are also able to deliver more specialized programs on endangered species and flight. In the past few years, we have hosted many students from the Lethbridge College Environmental Science program as well as veterinary students from the University of Calgary and the University of Saskatchewan. After seeing thousands of elementary school children, it is always interesting and inspiring to work with college and university level students who are pursuing careers that integrate more technical environmental science information. It is always very gratifying seeing the results and impact our youth educational programs have on our future environmental custodians. Many farmers and ranchers have told us how much more they value the hawks and owls that live on their land thanks to the environmental learning programs we have offered over the past 30 years. Some have told us that our learning programs have also inspired them to put up artificial nests for a variety of birds including hawks and owls. Many have also set aside acres of habitat for endangered Burrowing Owls that nest on their land.